the handcraft, the field of “pachypodium”, Baobab, Ramy or Canarium Madagascarensus. Reception at the airport, transfert to your hotel. City tour and visit. Overnight to your hotel Diego Suarez. Departure by car to Joffre village after visit the Amber Mountain Park. 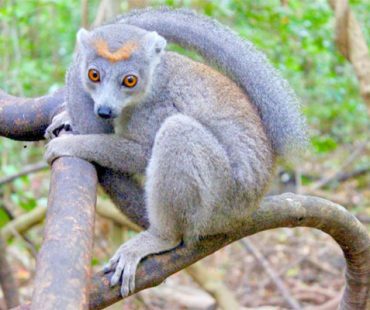 discover the reptiles, amphibians, birds, some lemurs: crowned lemur and fulvis. Animations and laughter on the program. By car, you leave Joffre ville in the morning to reach Mahamasina, Ankarana National Park. 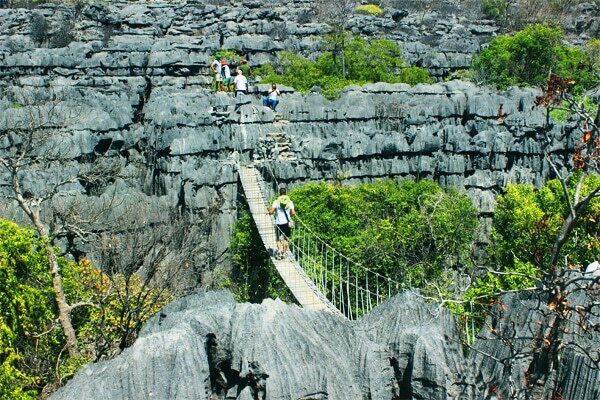 Extended on 18220 ha of limestone formation with the sharp top called tsingy, with caves, Aven or pit and dry forest. lemurs (Lemur crowned and probably Sanford), reptiles and amphibians, birds. To have more time for endemic species, your night will be at ecologde in Ankarana. Departure to Ankify and Transfer to your hotel ecolodge in Nosy Komba. Visit Nosy Komba, the special reserve that is Macaco lemurs home and other protected species since they are considered sacred. Discoveries reptiles and other species. You can choose also to the acquisitions of souvenir items , sculpture or fine wood, carved stone etc. Swimming contemplating the sunset. Overnight at your ecolodge in Nosy Komba. thanks to various multi color fish , coral and marine turtles, it is ranked among the most beautiful diving sites of the region. You will enjoy for hours of snorkelling. Cross by speedboat transfer to Nosy Be, for the discovery of the island of Nosy Be. After settling into your hotel. Tours and excursion around the island is in the program. his 03 sacred lakes and the Belvedere a magnificent 360-degree view of the island in Mont Passot. 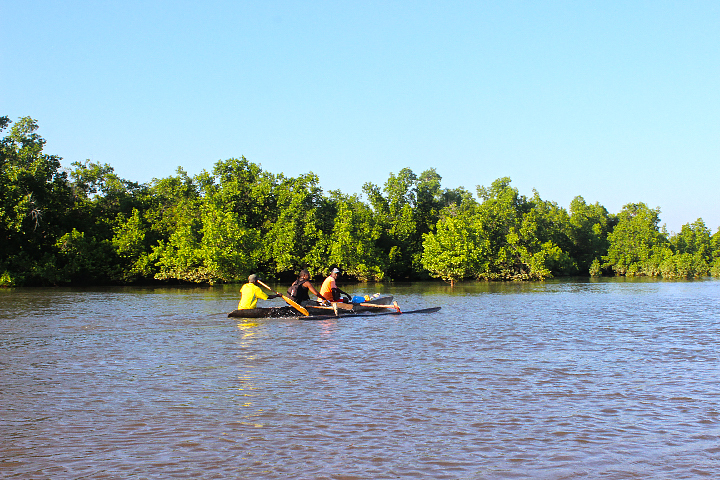 some of mangrove forest with 04 mangrove species, excellent quality cocoa plantations known in the world. After settling into your hotel, visit the cocoa plantation and the city. Animations on the program overnight at your ecolodge. Early morning departure by 4×4 to Antafiabe to discover blue eyes lemurs in Turks eyes, or “Eulemur macaco flavifrons” local endemic, are found only in these places. Discoveries in the area and picnic lunch there and reach Antsohihy. wild duck with white eyes (Aythia inotata) and red owl. Exchange and immersion with the local population. Back to Antsohihy. City Tour in the morning. Discover satrana (dwarf fan palm) and visit the handcraft manufacturer transformed them into decorative items. And then followed by the visit of the first president of Madagascar house with their hidden stories. Continue to drive and reach Manasamody point view, the field of “pachypodium”. the propithecus Coquerel, and large native trees, ramy or canarium madagascarensus. Depending on the season, in November we can make Bivouac in the reserve for nights to watch the aye aye or Daubentonia. Early departure by car for Ankarafantsika passed by Sofia bridge, the longest bridge in Madagascar. Remember the moment through pictures and continue to Ankarafantsika. Walk inside the National Park Ankarafantsika for the discovery the dense deciduous forest of the park. We can observe several rare species such as birds, reptiles, amphibians. Then join the city of Mahajanga in order to know the best historical and its particularity. or travel in first class by car to Antananarivo.